Robert Hurt, SSC, JPL, CalTech, NASA -- larger illustration. Make-make and Astronomy Picture of the Day). On November 21, 2012, astronomers using seven different Earth-based telescopes (including three operated by the European Southern Observatory) announced that Make-make may lack a "significant atmosphere" like Pluto or Sedna. Observed while occulting a distant star (NOMAD 1181-0235723), the dwarf planet appears to have an albedo of about 0.77, which is comparable to that of dirty snow, and is higher than that of Pluto, but lower than that of Eris. When considered with earlier observations, the new measurements indicate that Make-make has a density of 1.7 ± 0.3 grams per cubic centimeter, which enabled the astronomers to deduce that the dwarf planet has the shape and appearance of an oblate spheroid — a sphere flattened slightly at both poles — with axes of 1,430 ± 9 kilometers and 1,502 ± 45 kilometers (889 ± 6 to 933 ± 28 miles). Make-make does not appear to have a global atmosphere at a level of one thousandth of that of Pluto's atmosphere, but it may have an atmosphere that only covers part of the surface (ESO new release; and Jeff Hecht, New Scientist, November 21, 2012). 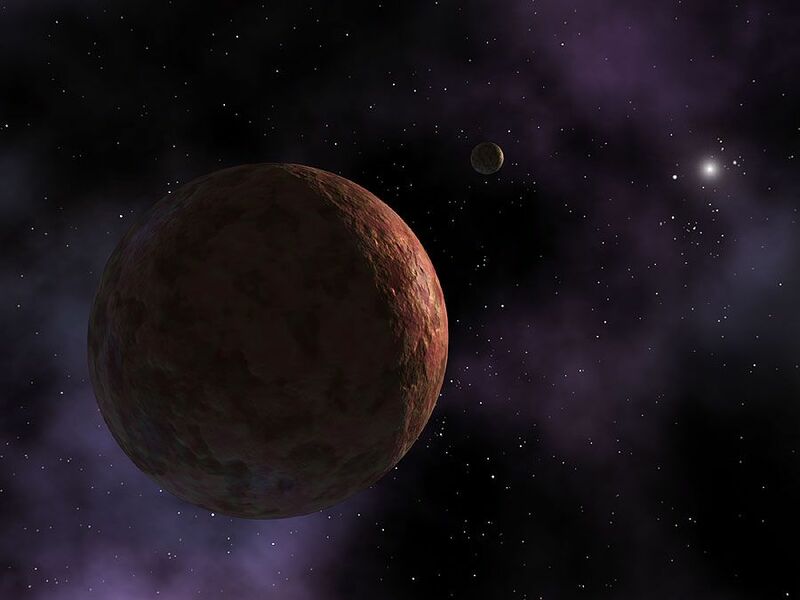 On July 29, 2005, a team of astronomers (including Mike Brown, Chad Trujillo, and David Rabinowitz) announced the discovery of a planetary body (2005 FY9) that appeared to be somewhat smaller than Pluto (more from the Isaac Newton Group of Telescopes and Licandro et al, 2006). The new name Makemake belongs to the god who created humanity in the South Pacific culture of Easter Island (or "Rapa Nui" in Polynesian), which was proposed by its discovery team, which discovered the object around Easter on March 31, 2005. Rapa Nui also has been known as the god of fertility and the chief god of the Tangata manu bird-man cult (who was worshipped in the form of sea birds that were his incarnation and carved in petroglyphs on Easter island as a man with a bird's head). On July 14, 2008, the International Astronomical Union (IAU) accepted the Polynesian name Make-make ("MAH-kay MAH-kay") submitted by its discoverers to replace the temporary IAU designation 2005 FY9. As the object is sufficiently large and round, the IAU declared Make-make to be a "dwarf planet." Since Make-make orbits the Sun beyond the orbit of Neptune, the IAU also assigned it membership to a class of substellar objects in the Solar System recently designated as "plutoids" (IAU press release). On June 11, 2008, the International Astronomical Union (IAU) voted at the meeting of its Executive Committee to establish bright "dwarf planets beyond the orbit of Neptune as a new class of substellar objects in the Solar System called "plutoids" (IAU press release). According to the IAU, these plutoids "are celestial bodies in orbit around the Sun at a distance greater than that of Neptune that have sufficient mass for their self-gravity to overcome rigid body forces so that they assume a hydrostatic equilibrium (near-spherical) shape, and that have not cleared the neighbourhood around their orbit. Satellites of plutoids are not plutoids themselves, even if they are massive enough that their shape is dictated by self-gravity. As of July 14, 2008, the three known and named plutoids are Pluto, Eris, and Make-make. In addition, "it was decided that, for naming purposes, any Solar System body having (a) a semimajor axis greater than that of Neptune, and (b) an absolute magnitude brighter than H = +1 will, for the purpose of naming, be considered to be a plutoid," so that many large and relatively round Edgeworth-Kuiper ice bodies may eventually be designated as plutoids. Make-make may have as much as two-thirds of the diameter of Eris or Pluto, or around 1,300 to 1,900 kilometers (or 810 to 1,200 miles. 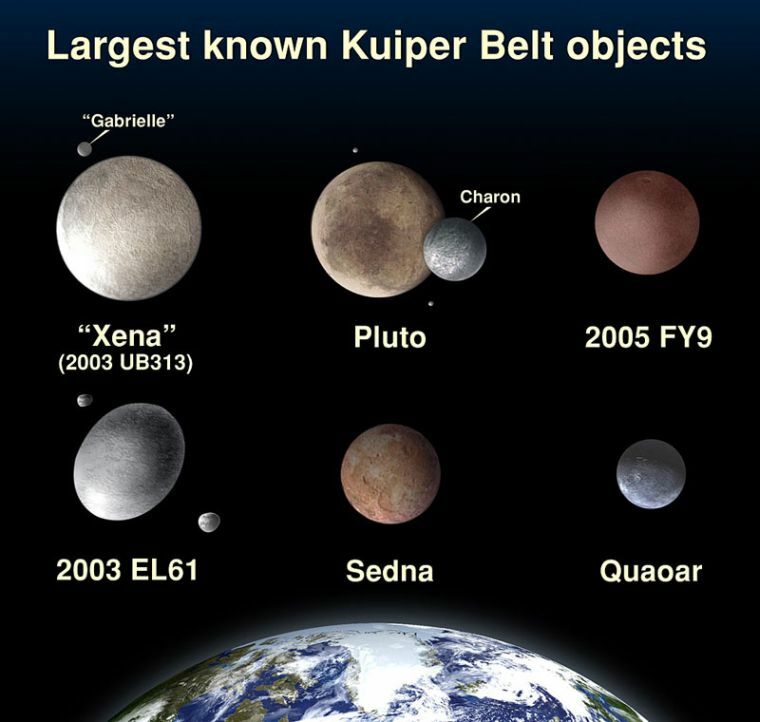 The object is also the brightest object in the Edgeworth-Kuiper Belt other than Pluto itself. 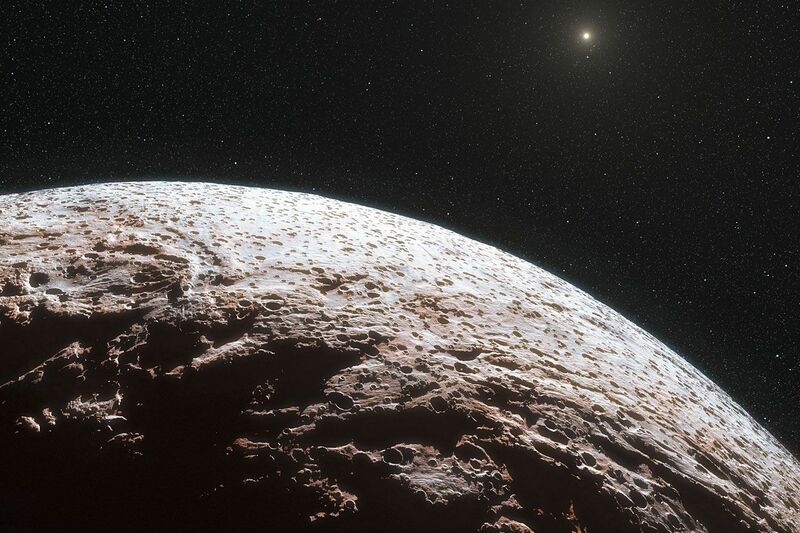 While reddish in coloration like Sedna that may be due to the presence of complex organic molecules, Make-make also has a shiny surface Pluto that may be from a coating of methane ice. 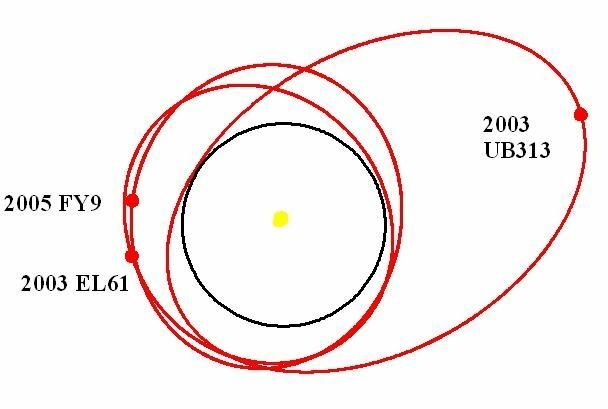 It moves around the Sun at an average distance of 45.8 AUs in a mildly eccentric orbit (e~ 0.16) and a relatively high inclination of 29.0 degrees, that takes nearly 310 years to complete. 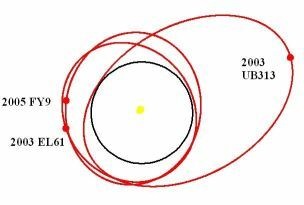 (More orbital elements are available from the Minor Electronic Circular for 2005 FY9 that was issued on July 29, 2005 and a July 17, 2008 update from astronomer Mark Buie). Some astronomers find Make-make's similarity to Pluto in the outer Solar System beyond Neptune to be significant. Pluto is the only known trans-Neptunian object known to possess a tenuous atmosphere. Given the comparatively similar size and surface composition, some believe that Make-make may have a simiarly atmosphere (more from the Isaac Newton Group of Telescopes and Licandro et al, 2006). Astronomer Mike Brown's discovery team maintains a web site that may provide some the latest available information on Dwarf Planets. More information and images of Pluto, Charon, and the Edgeworth-Kuiper Belt are available at NASA's Pluto-Kuiper Belt Mission and Planetary Photojournal. Fact sheets on Pluto and the Centaur object Chiron are also available from NASA's National Space Science Data Center. David C. Hewitt has collected more images and information on Edgeworth-Kuiper objects at his Kuiper Belt Page. For more information about the Solar System, go to William A. Arnett's website on "The Nine Planets", or to Calvin J. Hamilton's web pages on "Kuiper Belt Objects" and "Pluto." © 2008-2012 Sol Company. All Rights Reserved.